Tablet-News.net / Featured / Nokia calls ‘NEXT’ to TABLET their technology. Nokia Tablet coming!!! Nokia calls ‘NEXT’ to TABLET their technology. Nokia Tablet coming!!! “We have a number of options in the tablet computing space given the changing strategy that we have. For example, we could take advantage of Microsoft technology and software and build a Windows-oriented tablet, or we could do things with some of the other software assets that we have. 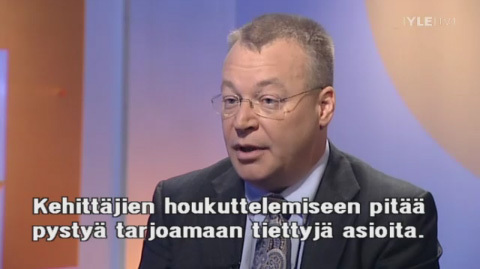 Our team right now is assessing what’s the right tablet strategy for Nokia how does that fit in,” said , chief executive officer of Nokia, in an interview with YLE TV-channel. The company clearly does not want to become a commonplace manufacturer of slates, but plans to create a separate, lone and exclusive slate. “There are now over 200 different tablets on the marketplace, only one of them is doing really well. My challenge to the team is I don’t want to be the 201st tablet on the market that you cannot tell from all of the others. We have to take a uniquely Nokia prospective and so the teams are working very hard on something that would be differentiating relative to everything else that’s going on in the market,” promised Elop. Okay now its clear that Nokia has put their foot down, the question remains: what type of operating engine will be under the hood? Android…but I’m leaning towards Windows. Windows is the likely answer with a Windows-based phone published this year. Plus, in late 2012 or early 2013, Microsoft intends to release its Windows 8 with GUI tailored for various devices, including tablets. Elop didn’t mention a timetable adding the company is finalizing the right strategy. The sooner the better.